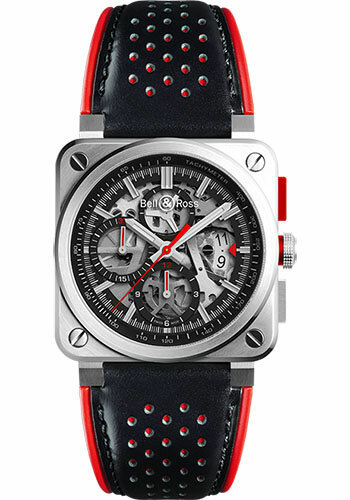 42 mm steel case with satin-polished, sapphire crystal with anti-reflective coating, skeleton dial with superluminova-filled hour and minute hands, calibre br-cal.319 automatic movement with hours, minutes and small seconds at 12 o'clock, black calfskin strap with red piping , includes additional ultra-resistant black synthetic fabric strap, satin-polished steel pin buckle. Water resistant to 100 meters. 42 mm satin-polished steel case, sapphire back, sapphire crystal with anti-reflective coating, skeleton dial with anodised orange movement bridge and Superluminova filled hour markers and hands, calibre BR-CAL.319 automatic movement with hours, minutes and small seconds at 12 o'clock; date; chronograph with 12-hour timer at 6 o'clock, 30-min timer at 9 o'clock, central chronograph seconds; tachymeter scale on the flange, black perforated calfskin strap with orange piping, also includes black synthetic strap, pin buckle. Water resistant to 100 meters.